Click on this link to go to the new IRE page! IRE is a user-editable clone of Ultima 6, based on the technology of the defunct AViOS project. Reign of the Just is my Ultima-6 clone, which uses IRE as its engine. It is currently in Demo 2, which makes it roughly 66% complete. There are versions available for Windows and Linux, but it can be made to work on any platform that IRE supports. For more details, click on the screenshot and go to the RotJ website. Fed up with 'Rule Britannia' over and over again when you want to see Lord British in Ultima 9? Here's a cure. This program will allow you to replace any of the songs in the game with a new song of your choice. IBM competition edition, VGA required. Like Version 2, but vastly inferior. Runs in real-mode, so will work on an XT. Javelin is a platform game in the style of the original Jet Set Willy but with 10 years of improvement. A 486 or later is needed for music and sound. Shouldn't be any problem today. It feaures 256 colour graphics, digital music and sound, 10 slot save and load. Includes full introduction flics, digitized artwork. Level editor and other tools are supplied. You play the part of a pilot working for a cowboy airline stranded on Sheep Island. In order to escape, you must journey through Heaven and Hell to find the clothes of Great Evil and deliver them to Arthur, king of the Natives. Includes POISON for WINDOWS 3.1, a useful utility to guarantee no more Windows crashes for the rest of your session. NB: PWD is Patch Wad Directory, not the UN1X command!. It is pretty well optimised (we tried to beat other libraries!) It runs in large memory model, and a separate version is availible for 286 protected mode. From the .DIZ: 256 colours, screen flipping, fast box draw. The ITG can handle GIF, PCX, FLI, CEL, COL and its own RSD files. The latest version of the ITG library, 7.5 is part of the IRE project. If you want a full-featured, cross-platform library, best wait for Allegro version 4 by Shawn Hargreaves. The ISD is a C++ library for playing up to four sound effects simultaneously through a soundblaster card. All playing takes place in the background, allowing the main program to carry on while the sounds are being played. This is for historical interest only and is not recommended for general use. Although Windows/95 has many bugs and other undesirables, one thing it does have is a loading screen. OpenDOS does not, so here is a little kit that allows you to correct this. Aimed at OpenDOS, this should work on other DOSes, but it hasn't been tested on them. In May 1994, while the members of IT-HE software were walking back to college, they decided that DOS did not really fulfil our requirements as much as they would have liked. We began to speculate on what our ideal operating system would be, and before you knew it, we'd drawn up our plans. This is the Dawning Of The Age Of Aquarius.. ..not as Paul said 'because it's wet'. However, we eventually setted on ITHEOS, which of course stands for IT-HE Operating System. Unfortunately, it never really reached critical mass, and the project fell over when we left college to go to separate universities. Almost as soon as we got hold of ID's popular game, DOOM, we started to hack it. Unfortunately we were not on the internet, and therefore we missed out on the doom specs, later versions of DEU (we had v4!!) and many other things that would have made it possible. By inspecting the WADfile, we deciphered the main file format independently of all help such as the Matt Fell specs. Next, we set to work on the individual sections. We had floors and sounds in under a day. Then, Martyn sat down and reverse-engineered the sprite formats by hand. I began to write a wad editor. It was crude, and of course, we did not know about PWADS in those days. After about three days, Martyn had written decoding routines which would handle about 99% of all the raw graphics in the WAD. And just as we were about to create the ultimate, the be-all and end-all editor, DOOMstick, James dropped the bombshell which sunk the project. He had found and downloaded the Matt Fell doom specs, Deu 5 (with source code) and all kinds of stuff. The level format was way beyond our understanding (We didn't know what linked-lists were, let alone BSP) and we didn't know that DOOM did texture overlaying. In the mean time, everyone else's editor was better. We had lost the race and gracefully retired from it. Although I do have some of Martyn's routines, there is no point in releasing them because they went up a technological cul-de-sac. Use NWT or DEUTEX instead. However, we did make some amazing DOOM add-ons. ATTN: AViOS needs a P200 and runs quite slowly on that. 39fps on that kind of hardware is not good enough for me. Therefore, I have decided to shelve the project indefinitely and use the techniques from this engine in an RPG, which is less fps-intensive. 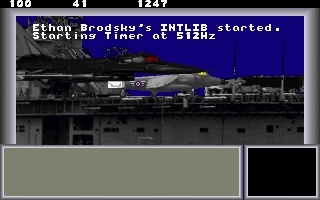 AViOS is my jump onto the bandwagon of user-programmable games, although I had got it running before I even saw Duke 3D or Quake. AViOS is a 2d scrolling game engine that runs under CWSDPMI. Click here to see the successor to AViOS This link is to another site.